Temperature profoundly impacts both the phenotypes and distributions of organisms. These thermal effects exert strong selective pressures on behavior, physiology and life history when environmental temperatures vary over space and time. Despite temperature's significance, progress toward a quantitative theory of thermal adaptation has lagged behind empirical descriptions of patterns and processes. In this book, the author draws on theory from the more general discipline of evolutionary ecology to establish a framework for interpreting empirical studies of thermal biology. This novel synthesis of theoretical and empirical work generates new insights about the process of thermal adaptation and points the way towards a more general theory. The threat of rapid climatic change on a global scale provides a stark reminder of the challenges that remain for thermal biologists and adds a sense of urgency to this book's mission. Thermal Adaptation will benefit anyone who seeks to understand the relationship between environmental variation and phenotypic evolution. The book focuses on quantitative evolutionary models at the individual, population and community levels, and successfully integrates this theory with modern empirical approaches. 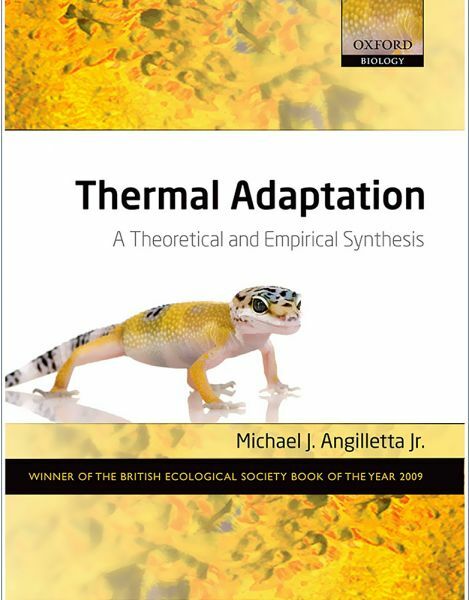 By providing a synthetic overview of evolutionary thermal biology, this accessible text will appeal to both graduate students and established researchers in the fields of comparative, ecological, and evolutionary physiology. It will also interest the broader audience of professional ecologists and evolutionary biologists who require a comprehensive review of this topic, as well as those researchers working on the applied problems of regional and global climate change.